What is a Tree Dragon? A Tree Dragon is a dragon that is bred to exhibit colours that mimic trees! While your typical tree dragon is a brown range primary with a green secondary, a Tree Dragon can actually be a broad range and this association is to help spread the Tree love! This is the Member's HQ for the Tree Breeder's Hub. Here you can read up on the many different types of trees, take part in discussions over genes and colours and take part in Membership benefits such as studding and nest rentals! Membership is always open and is self serve! Updated the Colour Ranges to reflect the new colours on the wheel. Did a little tidying of the wording for the Tiers, as well as added the missing Tier 'Dead Trees'! The Hub has been moved to it's new home in Dragon Share. Sales now take place in the sister thread, here! New link to the New Flower Association! Removed the Flowers category, as they now have their own association! New Hub Thread, New Admins. Same Great Tree flavour! It's pretty bare bones but is open for action! @serebronaga and @OverlordFreya are the current admin team for this hub. If you have any questions or comments, please send us a PM or ping us here! Add yourself to our Member List! Membership is always open and helps potential buyers find your hatchery as well as allow you to take place in hosted events and services. You do not have to be a member to be on the General Pinglist or the Specific Pinglist, but Membership is highly recommended if you want to reap all the benefits or just really love Trees. How Do I Sign Up to See All the Pretty Trees? Add yourself to a pinglist! + You can add yourself to the general pinglist if you possibly want to see every sales post (it's up to the seller whether or not they use either of the pinglists) and announcement. You can also just be on the announcements pinglist. + You can add yourself to the Specifics pinglist if you only want to see certain tree types, dragons or traits. Here is a link to the Pinglists! Please do not post sales in this thread, they belong in the Sales Thread! How Do I Use the Pinglists / Memberlist? If you need a little help, you can look at my example, which is at the top or beginning of every sheet or list. If the sheet or list runs out of room, you can add another row or column. If you're typing in a box and it's bigger than the space provided, the sheet will make room itself. + If you have any questions, concerns or comments about the memberlist or pinglists, feel free to send them to either of the Hub's admins: @overlordfreya or @serebronaga. [center][img]http://i.imgur.com/QjQSYd1.png[/img][/center] [center][u][size=5]Tier Breeding Explained[/u][/size][/center] Tiers are the Association's shorthand for what kind of dragons you are looking to buy or sell. For example, if you're only looking for a dragon that looks like a cherry tree, you would list yourself on the Specifics Pinglist under 'Specialty' (and hopefully leave a note that says you're looking specifically for Cherries!). If you're only looking for triple gened dragons, Seedlings and Saplings are not for you. Tiers are the easiest way to label dragons for sale, or as shorthand for what you are looking to buy. They are not meant as requirements for breeding pairs. Trees can pop up anywhere! ----- [center][b][u][size=4]Ranges[/size][/b][/u] [b]Brown Range[/b] [img]http://i65.tinypic.com/2iw37ya.jpg[/img] [i]Sand - Auburn[/i] [b]Green Range[/b] [img]http://i64.tinypic.com/23mwy75.jpg[/img] [i]Pistachio - Moss[/i] [b]Autumn Range[/b] [IMG]http://i67.tinypic.com/2lu2mx0.jpg[/IMG][img]http://i63.tinypic.com/2pp0uq0.jpg[/img] [i]Goldenrod - Caramel, Rust - Carmine[/i] -- [b]White Range[/b] (Primary Only) [img]http://i64.tinypic.com/1zzjl6o.jpg[/img] [i]Cream - Moon[/i] [b]Black Range [/b] (Primary Only) [img]http://i63.tinypic.com/iz93eg.jpg[/img] [i]Lead - Black[/i] [/center] ----- [center][b][u][size=4]Tiers[/size][/b][/u][/center] [i]Keep in mind Tiers are suggestions on how to classify your trees for your own use or for ease of sales. [/i] [b][u]Seedlings[/b][/u] Basic tree dragon. Does not have to have genes. Exhibits classic hallmark of brown primary and green secondary. Tert colour is irrelevant unless showing (then it would need to be brown range, green range, specialty range or other 'natural' colour.) Matching eyes are not necessary. [b][u]Saplings[/b][/u] Share the same requirements as Seedlings, but have at least two genes. Matching eyes are not necessary. [b][u]Trees[/b][/u] Share the same requirements as Seedlings and Saplings, but are triple gened. Matching eyes are not necessary. [b][u]Evergreens[/b][/u] [b](XYY)[/b] These trees are vaguely XYY. They have a brown range primary, and a green range secondary and tert. The greens do not have to match. Must be triple gened. Matching eyes (Wind, Nature or Earth) are highly recommended. [u][b]Oaks[/b][/u] [b](XYX)[/b] These trees are vaguely XYX. They have a brown range primary and tert and a green range secondary. The browns do not have to match. Must be triple gened. Matching eyes (Wind, Nature or Earth) are highly recommended. [b][u]Autumns[/b][/u] These trees aim to capture the beauty of the changing of the leaves that happen in Autumn. Brown range primary with an yellow/orange/red secondary. Terts are optional, but if displayed they should match either the primary or the secondary, or be another 'natural' colour. Matching eyes are not necessary. [b][u]Winters[/u][/b] These trees aim to capture the beauty of snow covered trees in Winter. Brown range primary or Black range primary. Green range secondary or White range secondary. Terts are optional, but if the secondary is Green range, the tert MUST be White range. Matching eyes are not necessary. [b][u]Dead Trees[/b][/u] These trees aren't as bright and cheerful as the others. Primary is Black range, secondary can be Brown range or Green range, but should be dark or saturated colours. Terts are optional, but if displayed they should match either the primary or the secondary, or be another 'natural' colour. Matching eyes are not necessary. [u][b]Specialty[/u][/b] Specialty Dragons are specific tree types, such as [url=http://images2.fanpop.com/image/photos/11400000/Sakura-japanese-cherry-tree-sakura-11430774-640-428.jpg]Cherry Trees[/url], [url=http://cdn4.kidsdiscover.com/wp-content/uploads/2013/08//11_3.jpg]Jacarandas[/url], [url=https://upload.wikimedia.org/wikipedia/commons/7/71/Birch_trees_in_Finland.JPG]Birch Trees[/url], etc. Bamboo dragons, flowering trees and flowering bush dragons all fall under Specialty. They can also make use of non-traditional ranges, such as pinks, purples and blues. Tiers are the Association's shorthand for what kind of dragons you are looking to buy or sell. For example, if you're only looking for a dragon that looks like a cherry tree, you would list yourself on the Specifics Pinglist under 'Specialty' (and hopefully leave a note that says you're looking specifically for Cherries!). If you're only looking for triple gened dragons, Seedlings and Saplings are not for you. Tiers are the easiest way to label dragons for sale, or as shorthand for what you are looking to buy. They are not meant as requirements for breeding pairs. Trees can pop up anywhere! Keep in mind Tiers are suggestions on how to classify your trees for your own use or for ease of sales. Basic tree dragon. Does not have to have genes. Exhibits classic hallmark of brown primary and green secondary. Tert colour is irrelevant unless showing (then it would need to be brown range, green range, specialty range or other 'natural' colour.) Matching eyes are not necessary. Share the same requirements as Seedlings, but have at least two genes. Matching eyes are not necessary. Share the same requirements as Seedlings and Saplings, but are triple gened. Matching eyes are not necessary. These trees are vaguely XYY. They have a brown range primary, and a green range secondary and tert. The greens do not have to match. Must be triple gened. Matching eyes (Wind, Nature or Earth) are highly recommended. These trees are vaguely XYX. They have a brown range primary and tert and a green range secondary. The browns do not have to match. Must be triple gened. Matching eyes (Wind, Nature or Earth) are highly recommended. These trees aim to capture the beauty of the changing of the leaves that happen in Autumn. Brown range primary with an yellow/orange/red secondary. Terts are optional, but if displayed they should match either the primary or the secondary, or be another 'natural' colour. Matching eyes are not necessary. These trees aim to capture the beauty of snow covered trees in Winter. Brown range primary or Black range primary. Green range secondary or White range secondary. Terts are optional, but if the secondary is Green range, the tert MUST be White range. Matching eyes are not necessary. These trees aren't as bright and cheerful as the others. Primary is Black range, secondary can be Brown range or Green range, but should be dark or saturated colours. Terts are optional, but if displayed they should match either the primary or the secondary, or be another 'natural' colour. Matching eyes are not necessary. Specialty Dragons are specific tree types, such as Cherry Trees, Jacarandas, Birch Trees, etc. Bamboo dragons, flowering trees and flowering bush dragons all fall under Specialty. They can also make use of non-traditional ranges, such as pinks, purples and blues. These images are examples of possibilities in the tiers. They do not represent exact requirements and are generated from the Scrying Workshop. Basic gene pair with brown range primaries and green range secondaries. Double gene pair with brown range primaries and green range secondaries. Triple gened pair with brown range primaries and green range secondaries with mixed terts. A triple gened XYY pair with matching eyes. A triple gened XYX pair with matching eyes. A mixed gene pair exhibiting autumnal colours. This pair would produce ineligible hatchlings, but provides visual examples of the two types of winter Trees. A triple gened pair that produces Jacaranda type Tree hatchlings. Would you like to advertise this association in your hatchery, dragon bio pages or forum signature? You can find our Association badge below. If you would like to create a new button, banner or tier breeder badges, we welcome your support! 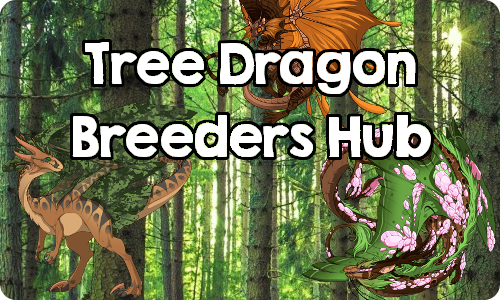 If you have a breeding association or hub and would like to affiliate with the Tree Dragon Breeder's Association, please PM/Ping either @serebronaga or @OverlordFreya and feel feel to snag one of our graphics above!